Dry aging beef (and other meats) is said to enhance flavor and tenderness. It is often used by upscale purveyors to distinguish their products from others. 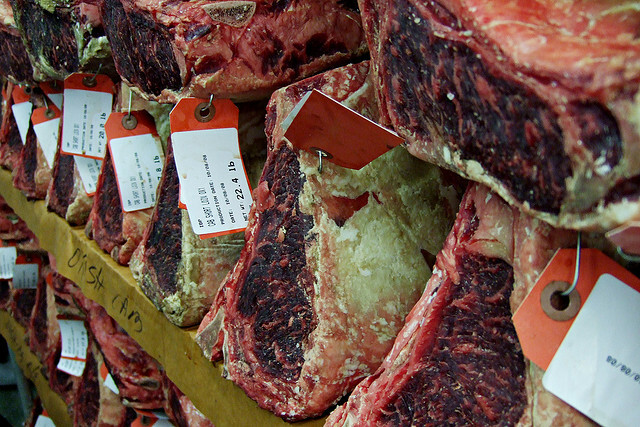 Dry aging meat is essentially aging meat without protection is a refrigerator. Cuts are stored separate from each other to permit air flow to dry them in 1-6 weeks. Natural enzymatic reactions result in a change of flavor and an increase in tenderness. Another major change is the loss of moisture resulting in a more concentrated flavor, but with a corresponding yield loss. Several vendors are selling “dry age” bags. The intention is to seal the surface of meat while permitting moisture loss (dry aging). In experiments with the bags the moisture loss is lowered (higher yield) while still permitting the “dry aging” process leading to flavor and tenderness attributes. The bags will also prevent yeast and mold buildup on the surface of dry aging meats. Dry aging charcuterie (salami, pepperoni, procuitto) is also possible in dry age bags. The main benefits would be allowing moisture loss and minimizing yeast or mold surface growth. However, caution must be used since the traditional process for these meats may not be the same when bagged versus left open. Regulatory concerns: The main concern regulators have for using these bags under the US FDA model food code is whether the bag results in a reduced oxygen packaging (ROP) process. The bag is moisture permeable and may or may not be oxygen permeable. Although the bags are quite thin, an oxygen transfer rate CoA (Certificate of analysis) is needed from the bag manufacturer demonstrating an OTR over 10,000 cc/m3/24h to exclude this process from HACCP (under the food code). If the OTR is below 10,000 or unknown then a simple HACCP plan is required. In this case storing the meat in the bag at ≤ 41°F for ≤ 30 days total (packaging to service) or ≤ 34°F for ≤ 60 days total (packaging to service) would be acceptable. The 30 day limit is considered two barrier packaging (refrigeration and competitive bacteria) and a “safe harbor” process in 3-502.12 of the Food Code. The 60 day shelf life would require a regulatory variance and is justified by limiting the maximum refrigeration temperature to 34°F using a 24/7 temperature datalogger.